Having decided to take a break from running Yen Hall Farm Racing, I now have some lovely horses that would suit the club very well, and I’m also going to add in another small element of interest. There will be five horses starting in the club and one potential jockey, namely William. The idea is that the horses will run in a mixture of jump and flat racing under rules, and in point to points. When possible, William will ride them. William has taken out his amateur and point to point licences and will be looking to gain as much experience as possible under both codes. When he is unavailable we will put the best available on. The five horses are a mixture of older, experienced campaigners and young, competitive horses with potential. One of them, Bisoubisou, is pictured with Harry up. The club will run from November 2018 until the end of May 2019 and will cost £165 per month. As before all owners prize money won will be split between the members at the end of the season. 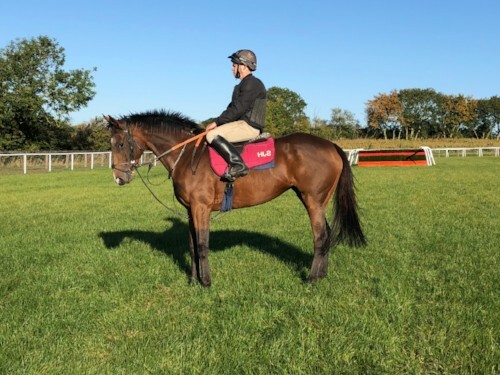 William will provide an interesting insight in how to become a jockey and there will be plenty of hospitality at the races, schooling days and chatter. With five horses covering jump, flat and point to point racing there will be many days out and lots to cheer on! If you would like more details do get in touch. Hope to hear from you soon.